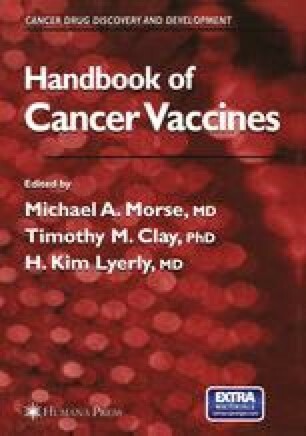 Studies first carried out in the early 1980s demonstrated that incubation of tumorinfiltrating lymphocytes (TILs) with high doses of interleukin-2 (IL-2) resulted in the generation of CD8+ cytotoxic T cells (CTL) that recognized tumor cells in a major histocompatibility complex (MHC)-restricted manner. This procedure resulted in the generation of tumor-reactive T cells from about 50% of patients with melanoma and a smaller percentage of patients bearing other malignancies. The in vitro sensitization of peripheral blood mononuclear cells (PBMCs) from cancer patients with autologous or human leukocyte antigen (HLA)-matched allogeneic tumor cells in mixed lymphocyte tumor cultures (MLTCs) also resulted in the generation of tumor-reactive T cells. These cells as well as the tumor-reactive TIL-lysed tumor and released a variety of cytokines including interferon-γ (IFN-γ), granulocyte macrophage colony-stimulating factor (GM-CSF), or tumor necrosis factor-α (TNF-α) in response to human leukocyte antigen (HLA)-matched tumor targets. Tumor-reactive class II restricted T cells have also been identified in a significant percentage of the cultures of sensitized PBMC or TIL cultures containing class I—restricted tumor-reactive T cells.